There are no excuses to not eat healthy when there are excellent options available just about everywhere, including deliveries made straight to your house! When I was offered to try out a month's subscription to Bestowed, I jumped at the opportunity because I am excited to try new, healthy foods, especially some that my kids will enjoy. As you can tell, my box was packed with a ton of great food! Obviously, because there is nothing left of it. 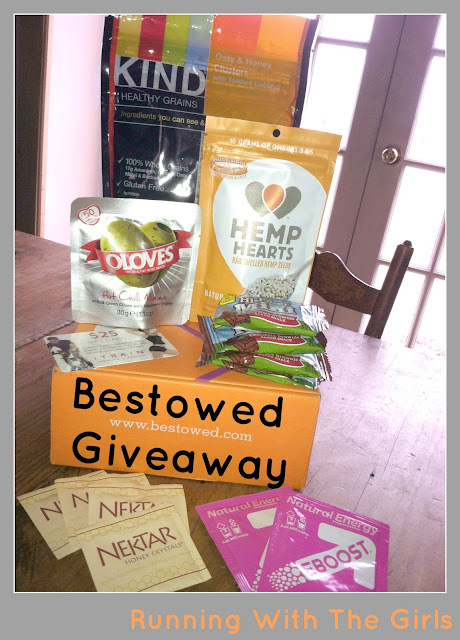 My box was packed with EBOOST, iTrain, Oloves Hot Chilli Mama Olives, Manitoba Harvest Hemp Hearts, KIND Healthy Grains Oats & Honey Granola, Gnu Foods Hi- Fiber Minis, and Nektar Honey Crystals. I could go on and on about how awesome these foods were. Really I could. I really enjoy trying out new foods. I love KIND bars, and was super excited to try the granola. I had to hide the bag from Izzy, because she loved it just as much as I did. I had never tried hemp before and loved how great it was for me and it tasted fabulous with greek yogurt. A Bestowed monthly subscription will cost $19/month. Each item in the box is hand-chosen by author and nutritionist Heather Bauer. Each month you'll get a different items, so it's always going to be a happy surprise when you open up your bright orange box! Each Bestowed box also comes with a printout of "What's Inside" with information about each product you've received. I thought this was a nice extra touch because I got to know a little bit about the companies, especially companies I've never heard of before. I'm pleased to announce that the awesome folks have offered a Running With The Girls reader a one-month subscription of Bestowed! know why you'd like to try Bestowed! I will choose a winner at random on Friday, May 10th. Disclaimer: I was sent a Bestowed box for review purposes only. All opinions are 100% my own. I would love to win a box b/c I am on a mission to find the right fuel for my long runs! The boxes seem like a fantastic way to try a variety of different products! I would love a box! I am looking for new things to try as fuel for my runs and have heard wonderful things about these boxes. I'd like to try it so I can expose myself to new healthy foods. Awesome review and giveaway! Thanks for sharing this! I always love to try out new goodies! I've been wanting to try Bestowed for a while... their products look amazing! I want to win because I love trying out healthy new to me foods. You know me, I love trying new things. So I'd love to try out a box! I would love to try it out! This is probably the best box type thing that I've seen and would love to see if that is the norm for this brand. I tend not to try new things because I'm worried I'll spend all that money and not like it or it won't settle well on a long ride/run. So I don't have much variety. I recently bought a wide range of things (though looking at the pile, it was mostly Gu Chomps in different flavors). I'd love to step outside of my "usual" though. Pick me!